Does Evidence Still Demand A Verdict? 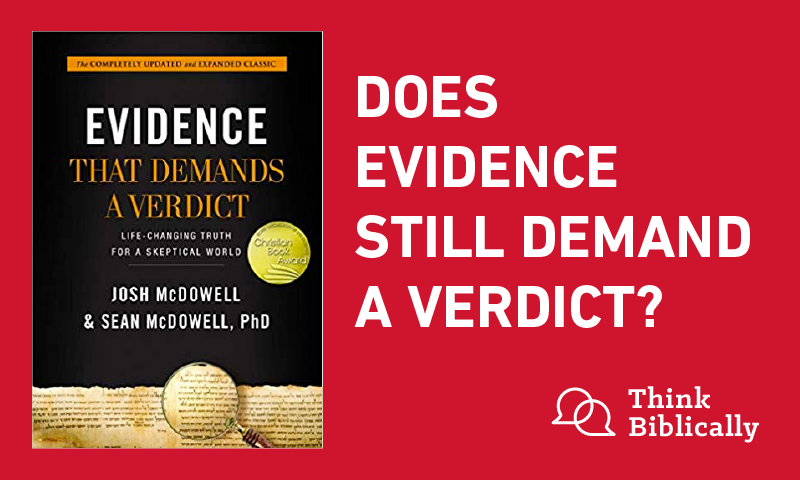 Working with a team of over three dozen Biola grad students, Sean recently helped his father, Josh McDowell, update his classic book “Evidence that Demands a Verdict.” Scott interviews Sean about how both culture and the historical evidence for Christianity have changed over the past few decades. The evidence for Christianity is more compelling than it has ever been, but as Sean and Scott discuss, it must be presented with kindness and love. Scott Rae: Welcome to the podcast Think Biblically: Conversations on Faith & Culture. I'm your host, Scott Rae, Dean of Faculty and Professor of Christian Ethics at Talbot School of Theology here at Biola University. Sean McDowell: I'm your cohost, Sean McDowell, Professor of Apologetics at Talbot School of Theology, Biola University. Scott Rae: We're here today, just the two of us, to talk about the recent book that Sean and his father, Josh McDowell ... you may recognize that name ... have released, update of their bestselling work, 'Evidence That Demands a Verdict" and "More Evidence That Demands a Verdict", first published in 1972. Maybe I won't go that road, but that was actually the year I graduated from high school. Sean McDowell: I was negative four, just to give a little context. Scott Rae: I think our listeners who were not around in 1972 might be really interested to know sort of what was it about your dad and his work on college campuses that motivated him to put these two massive volumes together? If you've seen these volumes, just an enormous amount of data and information that is incredibly valuable, has touched so many people's lives and given them a really nice plausibility structure for their faith. I mean, this was a ton of work. What motivated him to do this? Sean McDowell: He set out in the university, actually, at the challenge of a group of Christians to disprove Christianity. So he was actually going to gather the evidence and ultimately maybe compile it into a book, showing that Christianity is false. And the reason for this is he grew up in a small town in Michigan, deeply troubled background. His father was the town alcoholic. Older sister committed suicide. My dad was sexually abused for seven years by someone who worked on the farm, until he was old enough to slam him against the wall and say, "You touch me again and I'll kill you." Scott, we were sitting around recently as a family, and my sister says to my dad, "Hey, share a funny story, a good memory you have when you were a kid. And he's like, "Kids, I don't have one." Sean McDowell: And I wept. Well, he met a group of Christians in college who had a joy, a love, just a peace about life, and he wanted that. And they told him that it was Jesus Christ, so he thought it was a joke. He had enough money from a painting business in his lower 20's to travel, basically overseas, because at this time you couldn't Google or even go to your local library to look at ancient manuscripts, to find some of the archeological digs, to look at some of the historical evidence that was there. So he goes to Europe and the Middle East to disprove it, and ultimately ends up realizing, "My goodness, if I'm honest with myself, this is really true." Now, the evidence got his attention, but when he understood the love of God, that's actually when he became a believer. To make a long story short, when he became a Christian and God gave him the capacity to forgive his father and the man who abused him, he actually said, "That's when I really knew the evidence was true, when I had that changed life." Well, he ended up speaking on college campuses, and he'd speak on the evidence, now that he's with Crusade, and people would say things to him ... this is like in the '60s ... "Man, I wish I had that evidence." So he puts it together in a 14-page, like stapled it, and says, "I'm just going to sell them for a dollar." And they go gangbusters when he speaks, because there wasn't Lee Strobel, there wasn't J.P. Moore, and there wasn't William Lane Craig. Almost nobody was doing this. Scott Rae: There just wasn't much in the way of apologetics at all at that time. Sean McDowell: No, there wasn't. There was like Norm Geisler, C.S. Lewis, John Warwick Montgomery. Sean McDowell: Francis Schaffer, but nobody was popularizing this. So he did that, and then he decides, "I'm going to put this together into a book." For a year, types it himself on a typewriter, and almost no publisher wanted it. Sean McDowell: Nobody wanted it, because evidence consists of these really long quotes and documentation. It's not written like a normal kind of story. Well now, every Christian publisher and beyond wishes they had, because I think it's like 40-some languages, 4 million plus copies, I mean just unbelievable. I can't go anywhere without somebody telling me that this book helped them save their faith or God used it to draw them to Christ. So really, he didn't write it to prove Christianity is true, he actually wrote it as a result of trying to prove that it was false. Scott Rae: Basically, how influential ... if you had to summarize the impact of the book, both of them, help our listeners gt a sense of the impact that that's had. Sean McDowell: I would say a few things. World Magazine dubbed it one of the top books of the 20th century, all books. You could quibble if it belongs in there or not, but for somebody like World Magazine to say one of the top 40 books is pretty remarkable. One of the things in doing this update is I've had scholars contact me, people like Craig Keener, people like William Lane Craig, people like Mike Licona, who are now 50's plus, who when they were starting out in their teenage and college and graduate school year had nothing. And scholars like this saying either, "This was one of the factors that led me to do research" ... so William Lane Craig says it was really study with that on the resurrection that was a huge piece of motivating him to study this in grad school and beyond. And that's incredible. Craig Keener, one of the top New Testament scholars in the world, said to me, he posted something on Facebook, he goes, "Man, this book was so formative." And we quote him a ton. He goes, "I'm just like thrilled to be quoted in this." So I've had dozens of scholars tell me that. I can't go anywhere with somebody talking about it. And they always say, "I'm sure you've heard this," as if I don't want to hear it, but every time I hear it, Scott, it's just amazing. Like God's used my dad, a small farmer who had a speech impediment, an alcoholic father, to write this book. It's also been translated, I mean 40 languages worldwide. The emails I get from people around the world ... and this updated version is now just being translated into those languages. But I don't even know that we could put a number on it, how influential it's been. Scott Rae: Yeah. I mean, I think it's fair to say that in my lifetime I'm not sure there's been any book that's been more broadly influential in apologetics in the life of the church. Scott Rae: Count me among one of those. Reading that, although I read it after I came to faith, I recognized that it was everything that I had believed really was true, and there was good evidence to support it, and it very plausible to engage at that level. Tell our listeners a little bit, because lots of things have changed since 1972, lots of things about the culture, about the church, about the receptivity to the gospel, lot of things that are going on today that were not on the radar in 1972. So how's the culture changed since that was first written, and how has the revision of it kind of taken those things into it? Sean McDowell: This is a question I've asked my dad a lot, to get his perspective, because he's coming up on 79 and has been doing this five decades and a half or so. He said a few things. He said, "It used to be when I started off talking on college campuses, and I'd present evidence for the Bible, evidence for the resurrection, deity Christ, people would say, 'That's not true. Give me evidence. Prove it.'" Now, what's started to change kind of in the '90s with this increased tolerance kind of perspective ... you know, "That's insensitive, that's hateful, that's bigoted. What right do you have to say that?" So there's been a real shift in authority and how people even approach truth, in a sense from being truth's something you discover and submit your life to, to now, if I feel it, if I believe it, it's true for me. That's a massive shift that I think has taken place. A second shift is, I think how much we see people emotionally hurting in culture today. There was just a report this past week that talked about how loneliness is an epidemic, and it's higher among Generation Z, those below millennials now, maybe like five to 20 or 25, roughly, and it's epidemic. Depression, loneliness, seeing attempts at suicide, there's a real brokenness in the hearts of people that, again, shapes how they understand the gospel and shapes how they understand truth. The third change would just be the ubiquity of information. When my father first wrote "Evidence", what made this book an instant bestseller was people didn't have access to this information. Well now, there's a ton more apologists and people doing this, which is wonderful, but now just one click away, you have all this information. So why would something like "Evidence" be valuable? I can think of two reasons. Number one, in a world in which there's endless information and endless voices, I think trust is one of the most important commodities that you can have. This is what Biola has. There's a trust with this institution it's built over a long period of time. I think "Evidence" and my father had built trust that he's going to do his homework, do his research. Second, it just saves time. Go ahead and try to find all the research, but if you have one resource that saves time, that's the value of, I think, a text like this today. Sean McDowell: It's a lot of information. Scott Rae: ... and make sense of it. Sean McDowell: That's right, and find out what's good and what's not. Scott Rae: Maybe our listeners aren't that interested in this, but I certainly am. I want to know who did most of the work in updating it? Sean McDowell: Well, you know what? Nobody's asked me that question. Sean McDowell: Nobody has asked me who did most of the work. Here's what it entailed. I got three dozen graduate students, mostly in the apologetics and M.A. philosophy program. I got a student from Liberty and a couple others, and I had them researching, I had them writing, had them editing. We had 12 leading scholars, people like Craig Blomberg, Mike Licona, going through each chapter, giving us feedback. Michael Brown. So my job was to manage this thing, and time-wise, I mean nobody put more work into this than I did. That's hands down. My dad would say of course that's the case. It was probably as much work, or maybe more, than a dissertation. I wish I had clocked it, how much it took, but putting this thing together, coming up with a format, the research behind it. Clearly my dad did the work in preparing that, and I was regularly going back and forth to him, saying, "Do you like this argument? Would you change this?" But kind of the boots on the ground was all these amazing graduate students, and me just pulling this thing together. Scott Rae: That's really helpful about the process, because I would guess that some of our listeners might think that your dad was sort of passing the mantle to you with this, but it sounds like he was pretty significantly involved too. From knowing him, I'm not sure he's ready to pass the mantle to anybody. But would that be a fair assessment, that he sort of passed the torch to you with this? Sean McDowell: You know, that's another question somebody has not asked me, and I'm glad you asked it. One of the reasons he wanted to do this update was it had been two decades, like 1999, since this book had been updated. I think that was maybe the third update. Second, because I had gotten my PhD, started to teach at Biola, started a ministry of my own, to have two generations together really gives credit to his ministry. I think it gives credit to the book itself and gives a unique power to it. But it's also setting it up for the future that this "Evidence" brand, for lack of a better term, would continue. So my dad is a high control person. He'll totally admit that, but he's also pretty amazing at delegating. If he trusts you, and I built up trust with him, he's like, "Son, do it. Go for it, and just check in. Let me know what's going on," and let him weigh into it and give wisdom. So I think the way you phrased it was kind of passing on the mantle, but of course, his name should be at the top. People associate him with "Evidence". He's the one who has all the ideas for it and has branded it. But I think coming made it a pretty special project. Scott Rae: No, that had to be incredibly satisfying for him as a dad, to do this together. I mean, I can't think of too many things that would be more thrilling for a dad. Tell us a little bit about why do we have to update these, because have we learned that much more about the reliability of the resurrection? Have we learned that much more about the biblical manuscripts since 1999? I mean, the resurrection's not any more secure today than it was 20 years ago, I take it. So why do we need to update this? Scott Rae: Thanks to Dan Brown for that. Sean McDowell: Well yeah, that's right. He really did popularize that amongst the internet and other reasons. The idea that Christianity's kind of a copycat of these pagan mythical religions, that was not pressing. Even the historical Adam in the Old Testament section was not really a debated issue, but today that's a huge topic that we felt the need to cover. And then a third reason would just be that there is actually considerable new evidence that's been uncovered. Interestingly enough, my dad wrote an article two weeks ago in Fox News, and he had been using this phrase when I asked him, I'm like, "How does the evidence compare, not just from '99 but from when you started this to today?" And my dad's not one for understatement, just to qualify this. He goes, "Son, it's like there's a tsunami of evidence." I thought, "That's a really interesting phrase to use." So we wrote an article together. It was called, "There Is a Tsunami of Evidence for the Christian Faith". Tell my dad's story, talk about evidence. It was on Fox News. That article moved "Evidence That Demands a Verdict" into number 16 of all books on Amazon, second in all Christian books. And when people say, "People don't care about evidence anymore. They don't care about reason," I'm like, "That's pretty good indication when you have a provocative title, you tell a story, and you point people towards a resource that says, "Here's how you can know truth." I mean, it went viral. So I do think the basic arguments for the resurrection have been laid out for decades, the manuscripts, but there are some recent finds. I mean actually, even the number of manuscripts has grown substantially, and there's earlier manuscripts, and there's more manuscripts that actually have helped us uncover the original words of Jesus that were written down, with even greater security. There's been archeological finds that have been made. So these things don't advance as quickly as the daily news, especially given the president who's in office, who's always saying something provocative, but things are moving more quickly than ever. We probably expanded this, it's probably 70% new material from the last version. So I want people to know that there is a wide range of new evidence that's out there that's really worth considering and knowing for Christians. Scott Rae: Is there anything where you've had to kind of go back and reevaluate what was written previously, in light of new information? Sean McDowell: I would say there's a few examples that we found that I pulled out, that I went back and re-looked at the context and the statements, and they're like, "I'm not sure that I buy that example." So even on writing the update, my dad worked with an entire range of grad students from a different school, and these grad students, I said, "On this update, every quote, every example, every illustration that's used, go back to the original and make sure that it's accurate." So in a book that's 500 pages, you're going to find some. So I found a few quotes that I thought, "You know what? You look in context, this is taken out of context. Let's take this out." There was an example related to prophecy. My dad and I just differed on whether we found it persuasive or not. We pulled it out because it was equivocal. But there's no big finds that we go, "Oh my goodness, we have to like take this entire argument or this entire chapter out." It was just kind of quibbling with examples, finding better ones, removing some dated ones, find a few "mistakes", in quotes. And frankly, you have a book that many pages long ... And to be honest with you, Scott, I really felt the weight with this, because when this comes out, there's already people going line by line. If they can say, "We found 10 mistakes out of 800 pages," they'll try to dismiss it. And because how many people in the body of Christ use this, I felt the weight, like we've got to do everything we can to get it right. So yes, there's been some things we've taken out, but I'd say they're more on the fringes. Nothing substantive has been removed. Scott Rae: This is actually one of the best arguments for the reliability of the New Testament story, because the apostles and the authors of the New Testament, they had every incentive to get it right, because they knew that not only were people going to be looking to discredit their arguments, they were being flogged and beaten and killed for believing in the narrative of the life Jesus and the resurrection. There were really powerful incentives at work to make sure that they got every little bit as accurately as they could. Sean McDowell: This is actually a chapter we added, on the fate of the apostles. Did they die as martyrs? Because that was my dissertation. I published a 300-page academic book, not with Routledge, but that has not been accessible to people, so we added about a 15-page paper, what's the evidence the apostles died as martyrs, and did they really believe Jesus was risen? That's one of my favorite chapters in this update. Scott Rae: Sean, you often hear people say that people get loved into the kingdom, not argued into it. And therefore, yeah, apologetics is helpful, but sounds like what really turned your dad around was these people who loved him, and as you said, when he really got a grasp on what the love of God meant to him, especially given the idea of a loving father and kind of in comparison to his own. I mean, that's often ... I don't think that's meant to diminish apologetics, but maybe some people might say, "Well, it's just to put it in its proper place." How would you respond to that? Sean McDowell: I think it's a false dichotomy to say it's either love or reasoning with people. I think it's both. We're called to love people by giving good reasons, amongst other things. I mean, you just read the beginning of Acts, the apostles go out and they reason from the scriptures. They reason that they were eyewitnesses. They reason that Jesus has fulfilled prophecy. So they're making a case for this, but in one of the letters to the Thessalonians, Paul says, "We not only gave you the gospel, we gave you our very own lives." Jesus came in grace, and he came in truth. I think it's both. Now, with that said, people are also wired differently. I think of my friend J. Warner Wallace, cold case detective. He was not loved into the kingdom. He didn't care if people loved him or not, he wanted to know if this was true. And he's a little bit of an exception, I think. He thought it was true before he even understood what the gospel meant, because he examined the scriptures through forensic analysis and concluded that it was true, and then came to believe. I don't think my dad ... I mean, God is sovereign, so I can say from a human perspective, it was the evidence that got his attention, but it was the kindness and the love of the Lord that drew him. So I just look at apologetics as moving kind of ... not even boulders, necessarily, but just things in the path of the way, like potholes. I think it was Walter Martin who famously said, "Apologetics removes potholes on the path to the way to the kingdom." That's all it is. It's a ministry to help Christians with tough questions make sense of it, and it helps non-believers who are genuinely seeking and interested in truth, how those objections removed and given answers, so they can feel like they're placing a confident faith in Jesus Christ. So I don't ever want to overstate the role of apologetics. Because I love it, I probably get too excited about it sometimes, but on the flip side, I think people underestimate the role of it, and there's just a healthy balance in the middle. Scott Rae: Yeah, I can see, I think it's important to recognize that we require not just that our minds be changed, but our hearts be changed. I think the old adage that the heart doesn't rejoice in what the mind rejects, I think is still true. I hear a lot of millennials and Gen Z folks saying, "You know, your generation started talking to me, you were much more concerned about whether the gospel was true. I'm a lot more interested in if the gospel is good, produces good things." And so I see all the horrible things that have been done in the name of religion over the years, and you think, "Yeah, maybe it's true, but the real question is, is it good?" How does apologetics try to answer that question? Sean McDowell: I think you're right, and it's interesting to hear you say that, because I've said to apologists, about a year or so, I've said, "The primary question people are asking is not is Christianity true, but is it good?" Because if you don't think something is good, you're not going to entertain evidence or facts or reasons that you think that it's true. Well, if you look at a study by Gen Z ... this was put out by Barna, and it came out recently ... and they actually said some of the biggest objections people have are ... this is Gen Z'ers have towards the faith, I think Christians and non-Christians, you see the same kinds of questions. Number one is the problem of evil, which always has been the big question, it always will be, and that's not really the existence of God, that is, is God really good and loving? Another big one was injustices done in the name of Christ, which is again, is this good? Another big one was the hypocrisy of Christians; again, is this good? Now there are questions of science versus faith and other kind of truth-based questions, but right at the top is this question, is it actually good? And that's where I think relationships are so important. Yes, we have to be ready to give an answer. In fact, in the opening chapter that we add in "Evidence", we look at these 10 questions that Gen Z and others are asking and just answer them first before we get to the evidence itself. We want people to see that it's good, and then they'll consider the evidence. But I think what helps overcome that is that they know a Christian who believes this, and they're kind and they're gracious and they're loving. The way they live their life helps realize, "Gosh, maybe there is something good about Christianity, shapes the heart," that I think makes the mind, to a degree, potentially open. Now, with that said, one of the things that blew me away about this Gen Z Barna study was that 46% of Gen Z'ers said they are open for evidence for whether a religious claim is true or false. 46%, almost half, said they're open and looking for, to a degree, evidence. So we have to address the goodness question, like you said, but I think evidence is as relevant as it's ever been, but the way we present it maybe needs to change. Scott Rae: Yeah, we often challenge our seminary students here at Talbot that what's true on the individual level is also true at the community level, and our churches need to be seen as contributing good to the flourishing and to the common good of their communities. And we often ask our students, "If your church closed its doors, how long do you think it would take the community to notice before you were gone?" Sean McDowell: That's a great question. Scott Rae: Other than the real estate agents. That's, I think, an element that complicates the apologetic goal or the apologetic emphasis, that the book, I think, is so well equipped to try and do. But I think the task is more challenging, I think, than it was in the '60s and '70s. Sean McDowell: I think that's right, and one of the changes that I brought to it is, my dad first wrote this in the early '70s. You go through the '80s and early '90s, it was very much an us versus them culture and mentality. This is the way people wrote. My father on the free speech platform, you don't stand up there and have a conversation with somebody, you say things dogmatically and strong, and you debate. That's just how communication took place in that culture. Well, that's obviously changed for a number of reasons, so one of the things I went through this manuscript, I said, "Are we overstating things? Are we saying things a way that's firm but as gracious as we can towards people that disagree with us?" I think my dad's always been gracious, but he's just a fighter, because of the pain in his roots. And I think as we came together and said, "Let's make this case strong, but let's err on the side of being kind, being gracious, not overstating our case," that's one of the big changes of how church needs to be done, conversations need to be have, and I think you see reflected in this book as well. Scott Rae: Well, if you don't have your copy of "Evidence That Demands a Verdict" and "More Evidence That Demands a Verdict", the newest updated edition, let me tell you, it is still the standard reference work on Christian apologetics today. You know, you can say what you want about the plethora of materials that the original work in the '70s spawned, which is pretty significant, and if that by itself were the only impact of it, it would still be off the charts. But for all of you who care about the truth of your faith and want to have a really well-grounded ability to be able to present the reasons for the hope that's within you, as Peter describes in 1 Peter 3, you just can't find a better resource than this updated version of "Evidence That Demands a Verdict". It's been great just to talk about this together, and I would so encourage all of our listeners, this is a work that's got to be on your shelf. Granted, it probably doesn't fit under the heading of bedtime reading, but it's an indispensable resource, and kudos to you, Sean, and to your dad and to the team of folks who put all this together, a yeoman's work that's going to serve the church and the kingdom for a lot of years to come. Sean McDowell: Well, thanks, Scott. You really hit on it, that it was a team effort. Scott Rae: This has been an episode of the podcast Think Biblically: Conversations on Faith & Culture. To learn more about us, and to find more episodes, go to Biola.edu/thinkbiblically. That's Biola.edu/thinkbiblically. If you enjoyed today's conversation between Sean and me, give us a rating on your podcast app and share it with a friend. Thanks for listening, and remember, think biblically about everything.